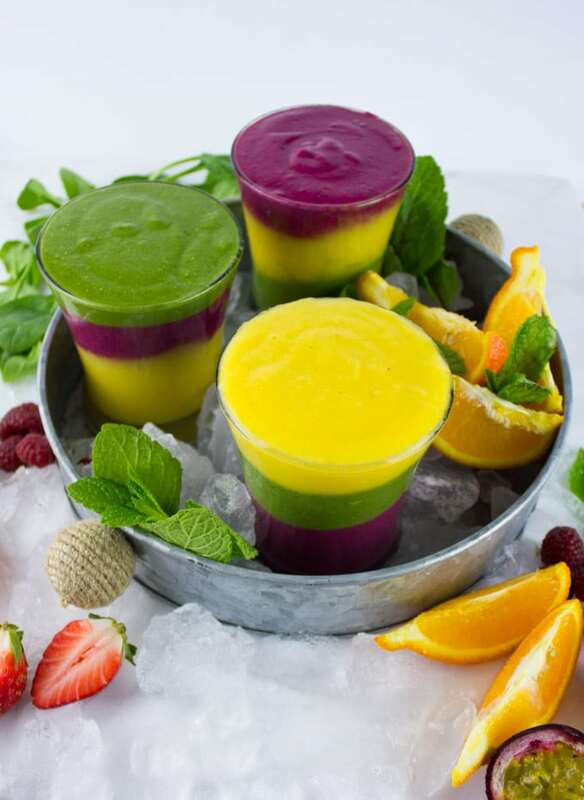 These Fruit Smoothie Recipes are crazy delicious, super refreshing and made me feel like Spring is here! 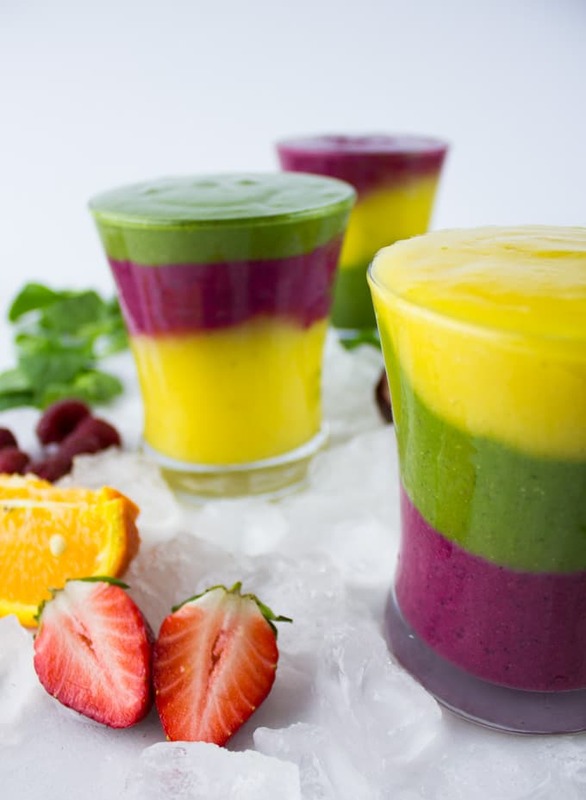 Plus Tips for making perfect fruit smoothies every time and for these fabulous layers! Another thing I love is that kids can happily drink those without realizing they’re drinking fresh beets! ha! Because I’m using whole fruits and veggies here, I’m relying on my Vitamix to do all the hard work. If you don’t have a really good powerful blender, I wouldn’t risk it breaking your blender. Here’s a breakdown of the layers: the Green Layer is from my favorite green smoothie this Hemp Matcha Kale Power Boosting Smoothie. I only replaced the kale with some spinach. For the bright yellow layer, I chose frozen mango, banana, passion fruit and oranges. Finally for the gorgeous deep pink layer, I went with fresh peeled beets, blueberries, raspberries, banana and pineapple for sweetness. Start by choosing the dominant fruit flavor your want. Now think about combining some other fruits for thickness, creaminess or sweetness. 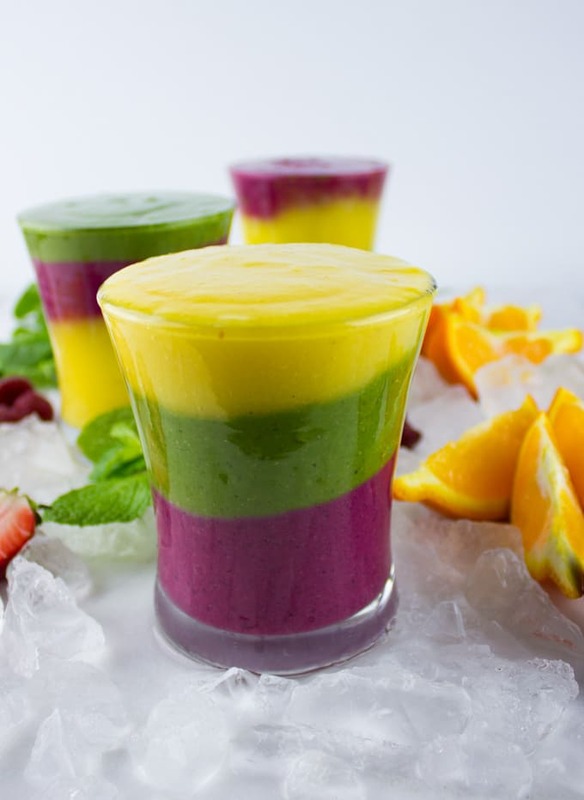 Then plan on freezing some of the fruits to make your smoothie cold and thick in texture. That’s the most general way to start your fruit smoothie recipe. Extras in your fruit smoothie may include a spice (like turmeric), or root (like ginger) or something like matcha powder. These add so many benefits and boost your fruit smoothie so much. Another thing I love adding is seeds. Chia seeds and flax seeds are top of my list. Nuts like cashews or almonds. Even more, you can add almond butter or cashew butter or peanut butter for creamy and nutri dense smoothie recipes. I’ve got a few other smoothie recipes on the blog, and they’re a blend of fruit, seeds and goodness. This Hemp Matcha Kale Power Boosting Smoothie is seriously a NO miss recipe! And this Espresso Brownie Chocolate Smoothie is a divine dessert in the form of a smoothie! Banana Berry Avocado Chia Smoothie – thick and creamy and perfect for berry lovers! Always always always make sure you have a high quality blender. I use a Vitamix and love it. Choose a main flavor to highlight and then build on that. For example if it lacks sweetness, think of a secondary fruit to make up for that. If it’s a fruit that’s thin when juiced, think of adding a thickener such as banana or avocado or nut butter to your smoothie. Freezing a large part of the fruits beforehand is important to keep the smoothies thick and cold, however store bought frozen fruit chunks work just as great! Adding seeds, nuts, spices and roots to your smoothies is always a plus! Hope you give them a try, I have to admit these really put me in a better mood, and even my pickiest little J. enjoyed them! And that’s HUGE! lol Enjoy! Blend each layer in a high speed blender and place in a separate container. 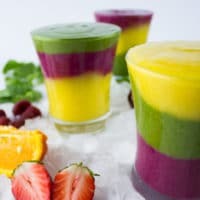 Layer the serving cups by pouring the bottom layer to the third bottom of the cups and then use a large spoon or small ladle to add the second layer carefully over the tops. Then gradually add the third layer. Serve and enjoy! 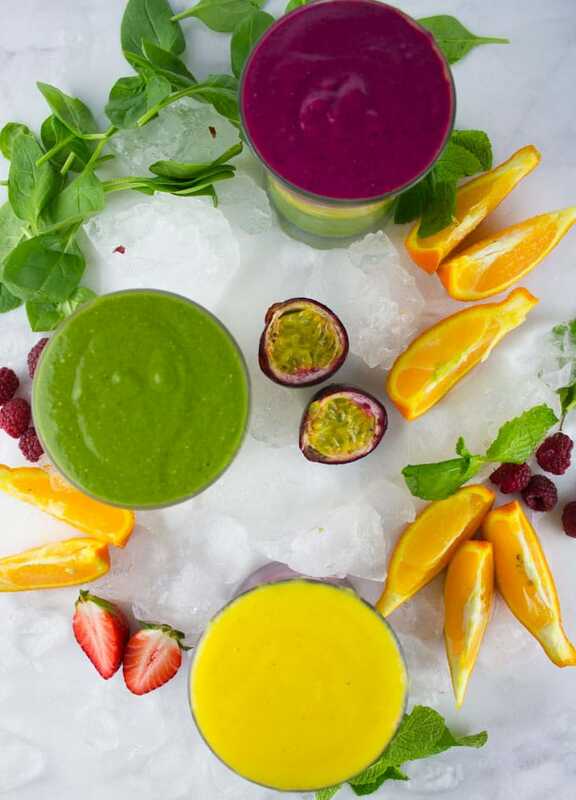 If it's a fruit that's thin when juiced, think of adding a thickener such as banana or avocado or nut butter to your smoothie. Thank you so much 🙂 Hope you make them soon! Loving all the colors! My kiddos would love this treat after school. Hope you make it Des!! These look so fun I cannot wait to try !! Love seeing all the layers! Thanks for the tip to get it right! Hope you make it Demeter! Can’t wait to see my kids’ eyes when they see this! I know they are going to love it! OMG! This looks so good and so healthy! I need to make it for my kids! Oh they’ll love it Catalina! This looks so much fun! Love all those vibrant colors!